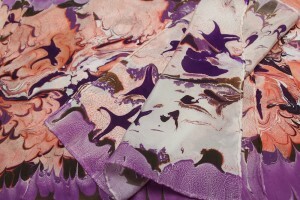 Marbling Fabrics as a one-day Sunday workshop at the Eliot School in Jamaica Plain, Boston with marbler Cristina Hajosy. Explore Turkish-style marbling on textiles such as ribbon, cotton, linen and silk. Combine beautiful swirls and mottling colors to create lovely, unique designs on pre-sewn scarves or on a fabric you can then use for clothing or other projects. Sunday, May 12, 2019 from 10am to 4pm. 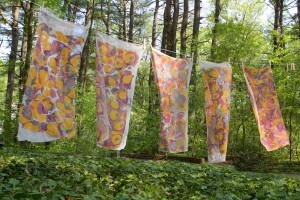 Marbling Fabrics as a one-day Sunday workshop at the Eliot School in Jamaica Plain, Boston with marbler Cristina Hajosy. 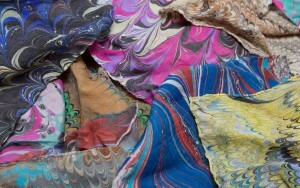 Explore Turkish-style marbling on textiles such as ribbon, cotton, linen and silk. Combine beautiful swirls and mottling colors to create lovely, unique designs on pre-sewn scarves or on a fabric you can then use for clothing or other projects. Sunday, February 10, 2019 from 10am to 4pm. Marbling on Fabrics as a one-day Sunday workshop at the Eliot School in Jamaica Plain, Boston with marbler Cristina Hajosy. Explore Turkish-style marbling on textiles such as ribbon, cotton, linen and silk. Combine beautiful swirls and mottling colors to create lovely, unique designs on pre-sewn scarves or on a fabric you can then use for clothing or other projects. Sunday, April 29, 2018 from 10am to 4pm. Marbling on Fabrics is a one-day Sunday workshop at the Eliot School in Jamaica Plain, Boston with marbler Cristina Hajosy. 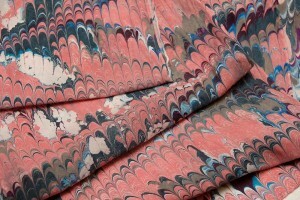 Explore Turkish-style marbling on textiles such as ribbon, cotton, linen and silk. Combine beautiful swirls and mottling colors to create lovely, unique designs on pre-sewn scarves or on a fabric you can then use for clothing or other projects. October 29, 2017.